Sweet potatoes from all over the world naturally contain genes from Agrobacterium, according to researchers from the University of Ghent and the International Potato Institute (CIP) in their study published at Proceedings of the National Academy of Sciences of the United States of America (PNAS). The researchers discovered the foreign DNA sequences of Agrobacterium while searching the genome of sweet potato for viral diseases. Because of the presence of this "foreign" DNA, sweet potato can be seen as a "natural GMO". The sequences appeared to be present in each of the 291 tested sweet potato cultivars and even in some wild related species. Different research methods confirmed the same conclusion: the specific sequences are not due to contamination, but they are part of the sweet potato genome. 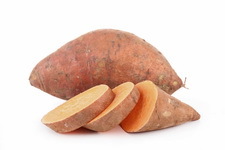 The genes in the foreign DNA sequences were also shown to be active in sweet potato, which can indicate that they provide a positive characteristic which was selected for by the farmers during domestication. Read the research article in PNAS.